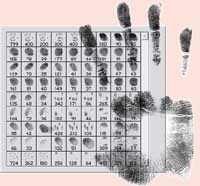 Fingerprints & Psychological Patterns of Personality! New fingerprint research from scientists in Moscow, Russia, indicates that in the future fingerprints might become a helpful tool for choosing the right job! The Russian researchers claim to have found evidence that some psychophysical parameters can be defined by means of fingerprints with an accuracy of 80% up to 90%. 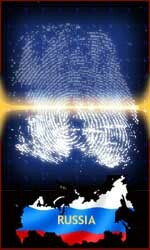 Scientists from Moscow found an interesting link between psychological patterns of a personality and fingerprints. This link gives unbiased characteristics for various abilities of a certain human being. Scientists developed devices for revealing psychological patterns of a personality by studying his/her dermatoglyphic parameters, i.e. papillary patterns of fingers and palms. For this purpose, researchers collected two databases: first - for fingerprints, and second - for psychophysical parameters, described by traditional methods. 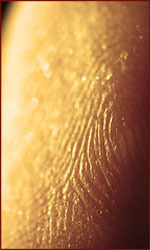 While processing data, scientists paid attention at strong links between fingerprint phenotype and psychological portrait of a certain person. Various psychological characteristics have their own papillary pattern. Some psychophysical parameters can be defined by means of fingerprints with 80%-90% accuracy. Moscow scientists have revealed an interesting pattern: psychological characteristics of individuals and the papillary patterns on their palms have a steady relationship! Accoring scientists from Moscow State Technical University, this might allows you to judge objectively the abilities and inclinations of individuals - which is especially important, for example, when choosing a profession. Bauman, the world famous 'baumanki', has developed devices to determine the psychological characteristics of man. In the new approach - not the traditional individual testing (answer the questions, draw pictures, etc.) - it is easier to say and study the dermatoglyphic parameters - the papillary patterns on the finger tips and palms. This approach, should be implemented with the help of computer technology, and eventually allowing for a numerical evaluation of dermatoglyphic skin features, ie, instrumental methods to investigate objectively the psychophysical status of individuals. But the new approach does not cancel the need of the traditional psychological methods. Rather, together they provide a more reliable understanding & application of personality testing. To get started, the authors collected and processed a huge amount of data that can be roughly divided into two main categories: • One - this concerns especially the papillary patterns of the subjects: what type of pattern form a line, that is, a 'whorl', 'loop' or an 'arch' - as oriented by design & position. • Another - the psycho-physical indicators, identified by a number of traditional methods. Of course, the author had to develop the software - for 'by hand' the daunting task would have been too much. The results turned out that these two independent properties - right hand prints of his fingers & the psychological characteristics - have a clear and very stable correlation. In doing so, the probability of correct identification of the indicators for psychophysiological status is very high: for some indicators, it is 80% and sometimes 90%. Over the years various studies have pointed out that certain aspects of human psychology & personality appear to be correlated with the fingerprints & hand dermatoglyphics. The 4th IBMBS Conference takes place in October 2009!